Today, at noon in Rome (5 a.m. CDT), it was announced that His Holiness, Pope Benedict XVI, has named me prefect of the Supreme Tribunal of the Apostolic Signatura, effective immediately. With the announcement, I ceased to be the Archbishop of St. Louis. I am deeply humbled by the trust which His Holiness has placed in me, and, in priestly obedience, I have pledged to serve our Holy Father to the best of my abilities. Although you will no longer pray for me as your archbishop, especially during the celebration of the Holy Mass, I ask your prayers for me, that I may faithfully and generously cooperate with God's grace in fulfilling my new responsibilities. Leaving the service of the Church in the Archdiocese of St. Louis is most sad for me. It has been an honor and gift for me to serve the archdiocese over the past four years and five months. It had been my hope to serve here for a long time, but, as the bishop who called me to priestly ordination often remarked, "Man proposes, but God disposes." I trust that doing what our Holy Father has asked me to do will bring blessings to the Archdiocese of St. Louis and to me. St. Louis is a great archdiocese which will always have a treasured place in my heart. In a particular way, I am saddened to leave my fellow priests, whom I have so much grown to esteem and love. Often, I have spoken about the remarkable unity and loyalty of our presbyterate. For me, it has been a special grace to work with them in the service of God's flock in the archdiocese. I thank them for the priestly fraternity which they have always shown me, and for the generous obedience with which they have responded to my pastoral care and governance of our beloved archdiocese. With regard to the governance of the archdiocese, the College of Consultors will meet to elect an archdiocesan administrator who, with the help of the consultors, will govern the archdiocese, until the new archbishop is appointed and installed. Please pray for the College of Consultors and for the archdiocesan administrator whom they will elect. Again, I ask your prayers. You can count upon my daily prayers for the Archdiocese of St. Louis, always. The Signatura is the court of last resort within the church, its Supreme Court. Its prefect is its administrator and something like a chief justice who has one vote along with the 20 other judges. Appointing an American to that post seems like common sense. Since 2002, many of the cases being appealed are brought by priests from the U.S., Ireland and Australia. They are men whose bishops want to laicize them -- take away their rights of ministry -- because of sexual abuse of minors. An English speaker who has seen how the scandal has ravaged the church and dispirited both the clergy and laity would have an advantage. The post is an important Vatican desk job, although the leader is not much in the public eye -- barring a rare hullabaloo over a case. Until 2002, this tribunal mostly handled appeals of marriage annulments. For the first time in the history of the St. Louis archdiocese, its archbishop has been assigned to a job in the Vatican leadership, its curia in Rome, removing him from pastoral work with the laity. 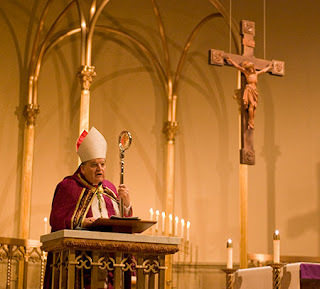 Burke was installed as the St. Louis archbishop in January 2004, coming here from his home diocese of Lacrosse, Wisc. There he had studied as a seminarian, been ordained a priest and after more studies to become a canon lawyer in Rome became its bishop. He was named to St. Louis after its former archbishop Justin F. Rigali, now a cardinal, was transferred to Philadelphia. Burke is warmly regarded by seminarians, by cloistered nuns and some St. Louis priests; he is wildly popular nationally with traditional Catholic grateful that he has promoted the Mass in Latin. However, he has not been popular with some priests and nuns here. "Oh, my gosh, that is marvelous news," said one parish priest on hearing the news Friday morning. He declined to allow his name to be used. "The priest morale here has been so low." Burke has been the most outspoken American bishop on not giving Holy Communion to public figures -- politicians -- who support abortion rights and public financing of embryonic stem cell research. In January 2004, shortly before the Missouri presidential primary, within a week of becoming St. Louis' archbishop, he told this reporter on KMOV-TV that he would refuse Holy Communion to Democratic presidential candidate John Kerry, a Catholic, because Kerry did not uphold the church's position on abortion. Last year, he said the same thing about then-Republican presidential candidate Rudy Giuliani. "The appointment is going to make every pro-choice Catholic politician very worried,” said the Rev. Thomas Reese, author of “Inside the Vatican” and a Jesuit priest. “After all, he made his name as a canon lawyer denying communion to pro-choice politicians." Now that Burke has been promoted to Rome, it will make some American bishops “much more sympathetic” to Burke’s efforts, Reese said. "Burke now will become a voice in Rome for cracking down on pro-choice Catholics." “The appointment shows Pope Benedict has reached deep into the American church to find people to help run the Vatican," Reese said. Until Pope Benedict XVI names a new archbishop for St. Louis, the archdiocese's college of consultors, a group of about 12 parish priests, likely will elect an administrator. This is what the body did when Archbishop John L. May was ill and after Rigali left St. Louis for Philadelphia. Bishop Robert J. Hermann, a Weingarten, Mo., native and now St. Louis' only auxiliary bishop, or another vicar general, Monsignor Vernon Gardin, will likely be named to the temporary post. No administrator can make permanent assignments during his tenure. In a rarer move, the Vatican could name an apostolic administrator who would have full powers of an archbishop. The much revered Hermann would not be considered for the permanent post of archbishop since he turns 74 in August. Bishops must offer the pope their resignations when they reach 75. [Leading the Signatura] is not a joyful post, but it is in Rome, a place where Burke enjoys living. He speaks excellent Italian and studied to be a canon lawyer there as a young priest. Beginning in 1989, he worked in another of the Vatican's three courts, the Roman Rota. Pope John Paul II named him Defender of the Bond, the lawyer who must defend the validity of the marriage in annulment cases. He left that post only when John Paul named him LaCrosse's bishop in 1994. The assignment also returns him to a mostly clerical world where he will have scant interaction with lay people except when he says public Masses. On a note of historic context, Burke becomes the tenth American prelate named to lead a Roman dicastery, and the first called from a Midwestern post since 1958, when an ailing Pope Pius XII named Cardinal Samuel Stritch of Chicago prefect of the Propaganda Fide. The first Stateside cleric chosen to lead a curial office, Stritch died shortly after taking up his duties in the Eternal City. It's also noteworthy that, of the ten, seven were heads of dioceses on these shores at the time of their respective appointments to the church's central government. While this morning's appointment brings the number of US curial chiefs to three, with 75 year-old Cardinal James Francis Stafford's retirement as head of the Apostolic Penitentiary (i.e. the Vatican's Mercy Czar) likely around the corner, as previously forecast on these pages (...and not without reason), the Holy See has now ensured that the figure wouldn't drop below two, thus maintaining a custom that's been in place for nearly a quarter-century. Burke called the news of his departure "bittersweet," and said he would miss his priests and seminarians most of all. "I really love this archdiocese, and it’s sad for me to leave," he said, before pausing, and breaking down. "I will never lose the deep affection I have for the archdiocese of St. Louis." Contrary to usual practice (which would see Burke serving as administrator until his departure for Rome), indications are that the St Louis archdiocesan consultors will sit sometime this afternoon to elect an administrator to serve for the duration of the sede vacante. All preliminary signals expect that, if not by year's end, the ninth archbishop of St Louis will be in place by Easter... and already, the field of possibles grows by the second.